, an English musician and composer, was born in London, 1738. 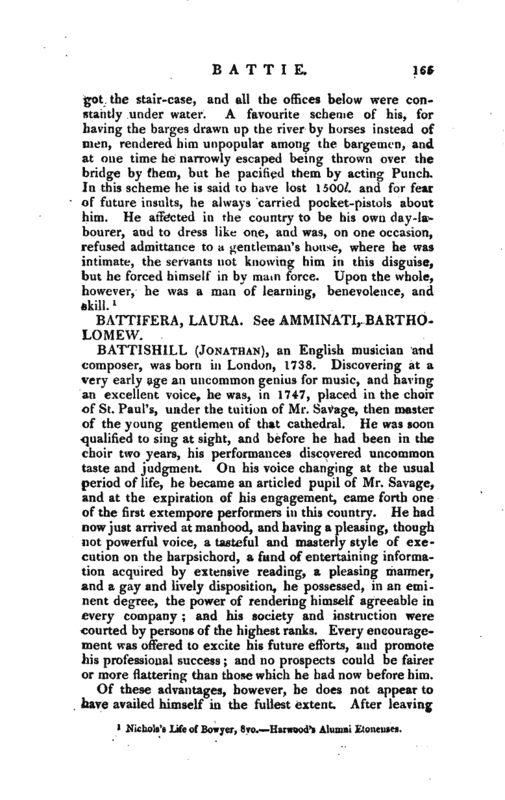 Discovering at a very early age an uncommon genius for music, and having an excellent voice, he was, in 1747, placed in the choir of St. Paul’s, under the tuition of Mr. Savage, then master of the young gentlemen of that cathedral. He was soon qualified to sing at sight, and before he had been in the choir two years, his performances discovered uncommon taste and judgment. On his voice changing at the usual period of life, he became an articled pupil of Mr. Savage, and at the expiration of his engagement, came forth one of the first extempore performers in this country. 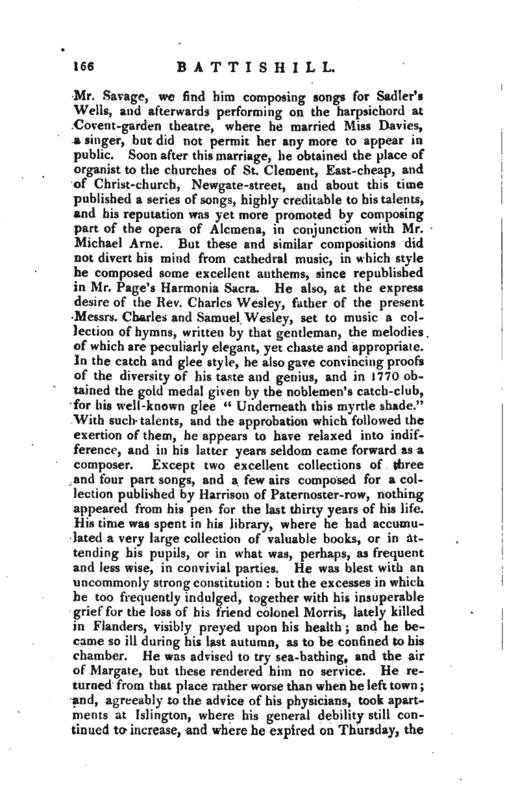 He had now just arrived at manhood, and having a pleasing, though not powerful voice, a tasteful and masterly style of execution on the harpsichord, a fund of entertaining information acquired by extensive reading, a pleasing manner, and a gay and lively disposition, he possessed, in an eminent degree, the power of rendering himself agreeable in every company; and his society and instruction were courted by persons of the highest ranks. Every encouragement was offered to excite his future efforts, and promote his professional success; and no prospects could be fairer or more nattering than those which he had now before him. 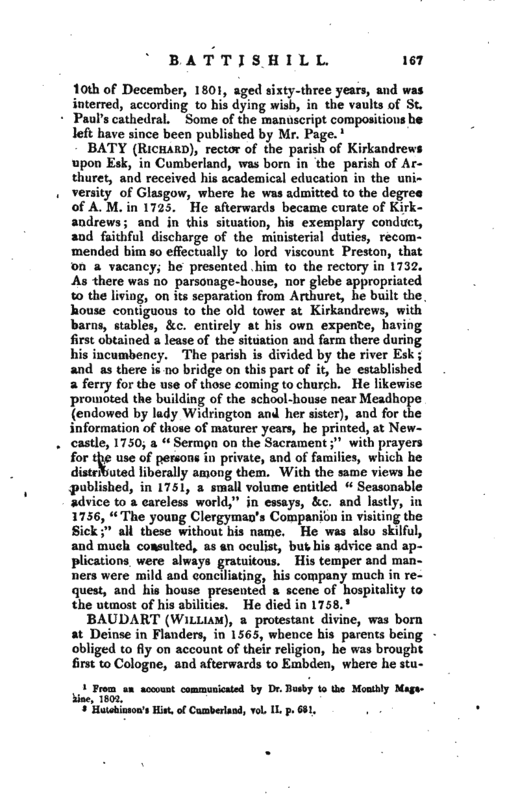 From a account communicated by Dr. Busby to the Monthly Magazine, 1802.